Emily and I had a few people over for one of our regular bbq’s when I noticed a small creature crawling along the fence. 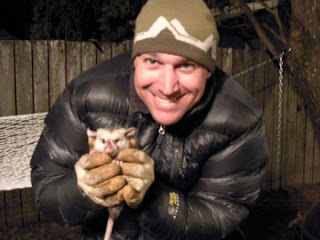 To my disbelief it turned out to be a baby possum. When I approached it I noticed that it had a torn up snout, probably from a cat attack. Emily and I decided to take care of it for the night until we could figure out what to do with it. We put it in a cardboard box for the evening and in the morning I called a wild animal shelter and was told that because it was an invasive species (introduced in the early 1900’s) they could not take it. I was forced to let it go again in the backyard knowing that it probably would be quickly picked off by a cat. Possums are very nasty looking and have nasty attitudes as adults, but honestly, as babies, they are pretty damn cute, especially when they curl up in a ball in your hands looking for warmth and protection. I hope he’s still out there alive somewhere.